Ok, folks, some readers have expressed additional interest in the Optical Navigation (op-nav) images of Enceladus we took on Sunday night. They were posted within our raw image gallery , but I thought it would be a good idea to have them linked here. If nothing else, these images remind us of the scientific thrills to come in a few short days! 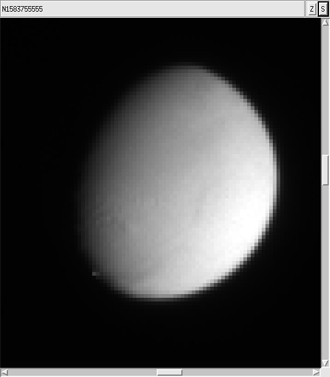 The Enceladus_no_zoom image (at left) shows the entire frame, with exposure times optimized for Enceladus. In this view, it is difficult to discern background stars. 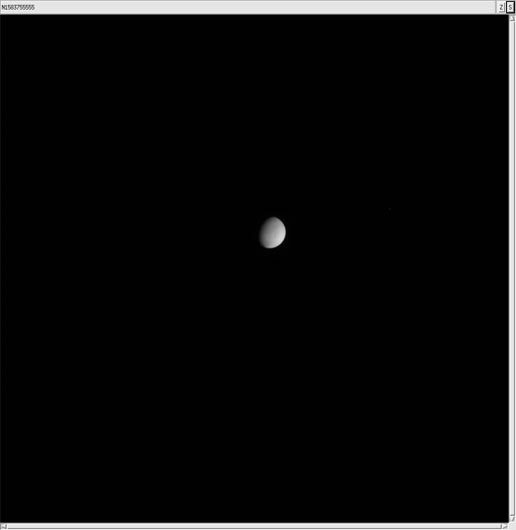 One can zoom in on this image of Enceladus, and that’s seen in the image Enceladus_zoom (the next image down). These images, though intriguing and titillating, aren’t too useful for measuring the relative position of Enceladus. The next three images have a longer exposure time, in order to capture background stars. Enceladus_stars_bg_noID may not win any photo contests, but all the important stuff is there — a brightly lit crescent Enceladus, background stars, and even some typically seen cosmic ray hits. The stars seen in this image may seem very nondescript to you and me, but our op-nav experts know exactly which stars are which, thanks to excellent astrometry from orbiting telescopes like Hipparchos. The picture labeled Enceladus_stars_bg_withID identifies a few background stars seen in the prior image. artifact of horizontal banding seen in earlier images. 60-millisecond peek at Saturn’s orbiting ice ball. Not bad! Thanks for posting those images – a lot of us “space enthusiasts” out here have been looking forward to seeing those! It doesn’t matter that they’re blurry and lacking in detail, they’re still wonderful, and real teasers for the images that will come back of the fly-by itself late tomorrow. Many of us here in the UK and Europe are going to have a very, very long day at work waiting to dash home and see what new wonders Cassini has seen! Thanks also to you and everyone else who is contributing to this blog. It’s great to be able to follow events as they unfold, share your expectations and feelings and ride alongside Cassini in spirit of not in person. Blogs like this make these huge, complicated space missions seem much more human, they give us more of a connection to the people behind the acronyms and data, so thank you all for taking the time to write your posts for us, we appreciate it. Godspeed Cassini. Show us wonders tomorrow! Next Next post: Enceladus Approach Maneuver Cancelled — We&apos;re Good to Go!